Over the last 12 months I’ve launched two online courses – Beautiful Brand Bootcamp and Create in Canva with Confidence. Added new opt-ins, implemented new systems as well as designing over 50 new brands and sub brands – as well as a few rebrands too! Plus hundreds of ebooks, pop up banners, kindle book covers, social media graphics, memes, signage business cards, labels, mugs, notebooks…. I mean you name it, I’ve designed it this year – and I do really love designing – it’s been an amazing year. Last year I made a note in my journal that I wanted to launch premade branding kits and open a shop and I’ve literally thought about it every single day since… it’s something I really want to do – literally have free reign to do anything I wanted – create premade professionally designed brands for start-ups – what’s not to like about that? So “open a shop”, specifically “open a Creative Market shop,” sat there for a while but I finally did it last month and launched! If you’ve been following me for a while then you’ll know branding is more than just a logo, it’s about being unique, it’s about your personality, your communication, your service, your products, your videos, your services, your content, your visual presence. It’s how people hear, see, feel, think, read, believe, hope and wish for from you. Everything you ARE and DO. Your logo, colours, fonts, images, business name, printed marketing, shapes, form. This is the super exciting part where all your fun and creative decisions are made as you create your business. Identity will help to build and strengthen your brand. Design is the part that adds that tangible element to your business – it makes it real. DESIGN ADDS TANGIBLE VALUE TO YOUR BUSINESS. What you do, especially if you are a coach or offer a service, is often intangible – the results are tangible – the after effect if you like – but the work you do – it’s not like you sell a product, right? Design and visual branding is the tangible part of your business, your chance to make the right first impression. Setting the stage to show your potential customers what you are all about. And whether you like it or not, it’s actually a bit like peacocking – it’s about drawing in your customers to attract their attention. And that’s really where the idea came from! Visual Branding really is quite simple, what colours are you attracted too, what is the personality of your brand (excited, calm, supportive, strong, bold, intuitive… insert what your brand is to be), what fonts do I like… oh but then you get lost on Creative Market and spend a whole day wasted swooning over every font and become totally confused. BUT what if someone gave you the solution? 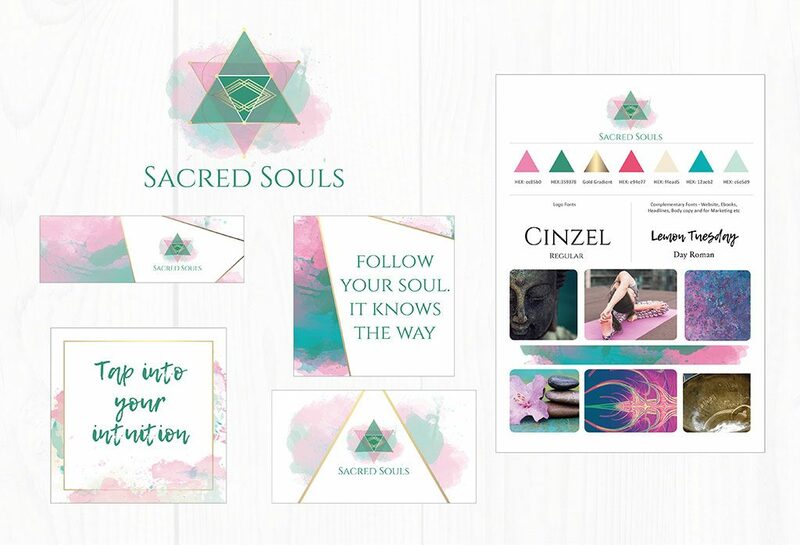 A professionally design premade brand kit that outlined your fonts, colours – better still HEX codes, imagery, tons of mix and match elements to personalise and create your own brand on your own terms – and you could start today. AND THAT’S ALSO WHERE MY IDEA CAME FROM TOO! If you like changing your brand – nothing wrong with that! If you wanna start TODAY! My premade branding and logo kits have been designed with you in mind – it’s literally like a brand in a box and you’ll feel like you’ve been Magically Branded. You’ll be able to download, brand yourself, launch and go! YAY! 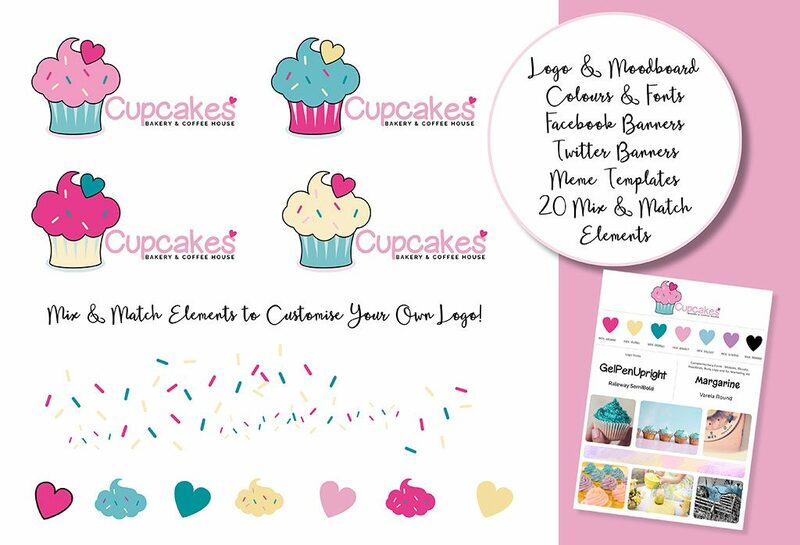 So what’s included in the premade branding & logo kits? Loads of Mix and Match Logo Elements and Icons: from high resolution to low resolution so you can use on your website or have them printed on brochures etc. In this kit for the health and well-being market, there are 85 mix and match elements! Each kit really is a unique, professionally designed brand by myself. I’m gonna be adding lots of kits to the shop too, as well as office décor, social media kits, planners and I’m learning font making too. No sample text is supplied with the files as you can add you own text easily using a free online design tool like Canva. And you don’t need to stick to the fonts I’ve suggested either – you can choose one you already have bought, you can buy one or you can download for free from Font Squirrel or DaFont, making sure you select the 100% free option. So what’s the difference between premade branding and logo kits and working 1-2-1 with me on a branding package? Well, a premade branding and logo kit is just that. It designed by myself using my creativity following no brief. All you have to do from a client perspective is choose a kit, download, and create and design something wonderful yourself using software like PowerPoint, Canva or Picmonkey. You are the one that personalises the kit. On the other hand when working 1-2-1 with me – that’s what it’s about, it’s about creating something which includes you, it’s custom made, it’s unique to you, and you are involved throughout the whole process. From inspirational brand identity to timeless logo design and much more. I do way more than design. I spend time with you. We work together to brand your full business. I create and design a tailored, one of a kind, brand that will literally transform how you look and how you feel about your business. It’s about revisions, tweaking your brand as we go, discovery calls, feedback, finding out your likes and dislikes, the vision for your brand, working together as a team to design the whole brand – and all created from the beginning with you right there, with me, working as a team. How many times will the premade branding kit be sold? It will be sold multiple times. But if you want you can have sole rights to one of your kits BUT only if it’s never been sold before. You can contact me directly to discuss this. Once I download the premade branding and logo kit, then what? 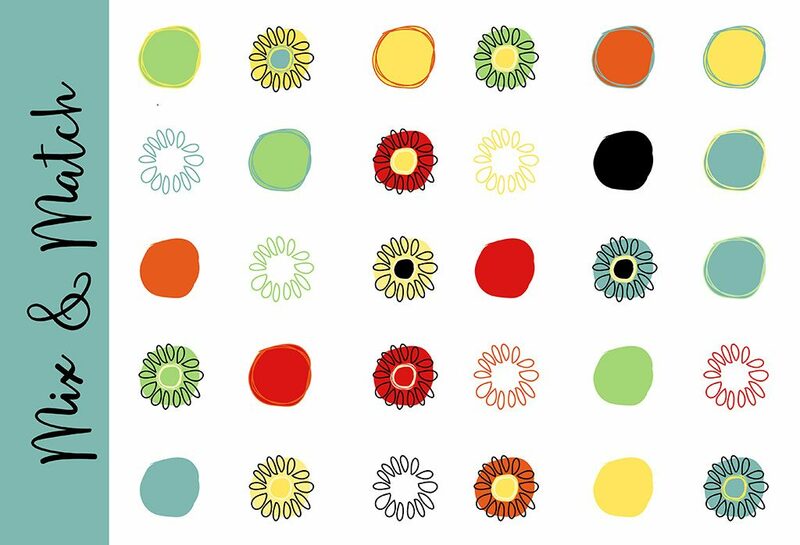 Within the graphics kit; all files are in JPG and PNG image files and can be used with free online programs such as Canva and PicMonkey. 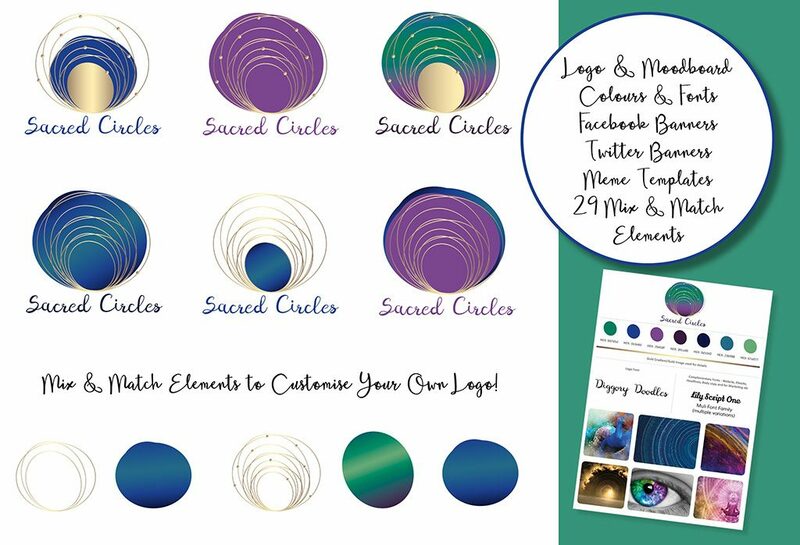 If you want to learn how to use Canva confidently and with ease then you can purchase my Create in Canva with Confidence course to show you how to use your new branding kit to create your personal logo, add HEX codes, fonts, save your images and create eye-catching ebooks, FB ads, mockups, here. Showing you what file types to use for what, what font combinations work, how to install fonts, plus a whole section on logo design too. 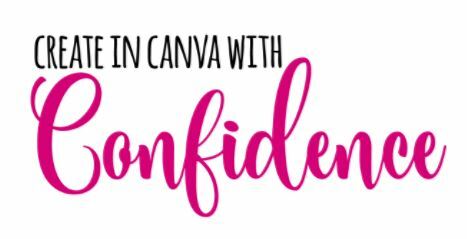 And the best part is you will get my Create in Canva with Confidence course for half price (£19.50 /$25) when you use the coupon within the kit download. Or grab my free Canva course to find out how to get started to personalize your brand kit. In this mini masterclass, I show you how to design your beautiful content for your brand all with the help of a free and simple tool – Canva! How to add jumpstart and dig in to your designs so you’re always consistent and always on brand. Are fonts and stock photography included in the kits? No stock photography is supplied with the kit but you can download images at: https://pixabay.com/ which are 100% commercial free. You’ll see I’ve thought of everything for you. 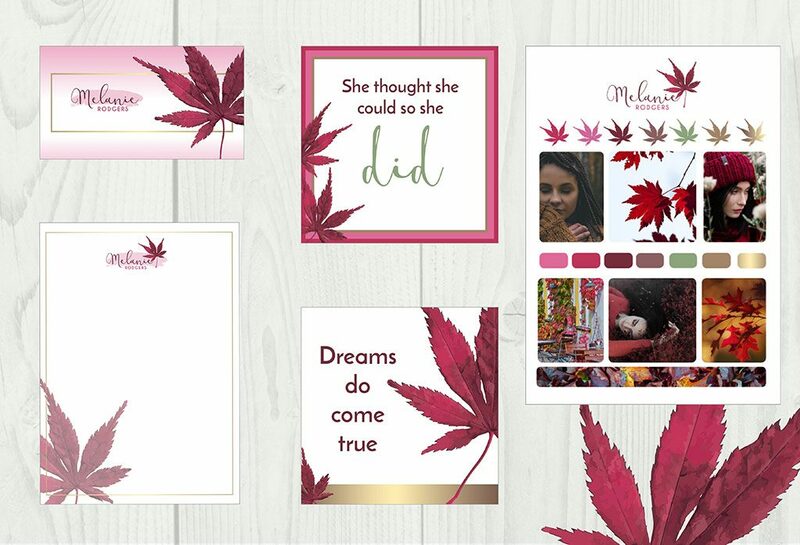 So if you are just starting up, have a limited budget, want a gorgeous brand and logo now, want to be in control of your brand, want to feel pride in your business and you want to look like a pro instantly – then come visit the shop – and remember to follow me as I will be adding new products every week.